The Sound Devices MM-1 is a single-channel, portable microphone preamp and headphone monitor designed for monitoring sound for film (boom operators), broadcast and ENG, field recording, voice-over work, and corporate/industrial environments. The mic preamp features exceptional audio quality, with a dynamic range exceeding 120 dB and an audio bandwidth from 10 Hz to 50 kHz. The balanced XLR microphone input provides user-switchable +48V, 12V, and 12V-T phantom power. A separate balanced monitor input accepts balanced or unbalanced line-level signal. The 1/4" TRS headphone output is capable of monitoring microphone signal, external line level signal, or a mix of both. A 3-position low-cut filter switch eliminates noise below 80 Hz and 160 Hz. The compact unit features a belt clip and is powered with 2 AA batteries or an external DC power source. 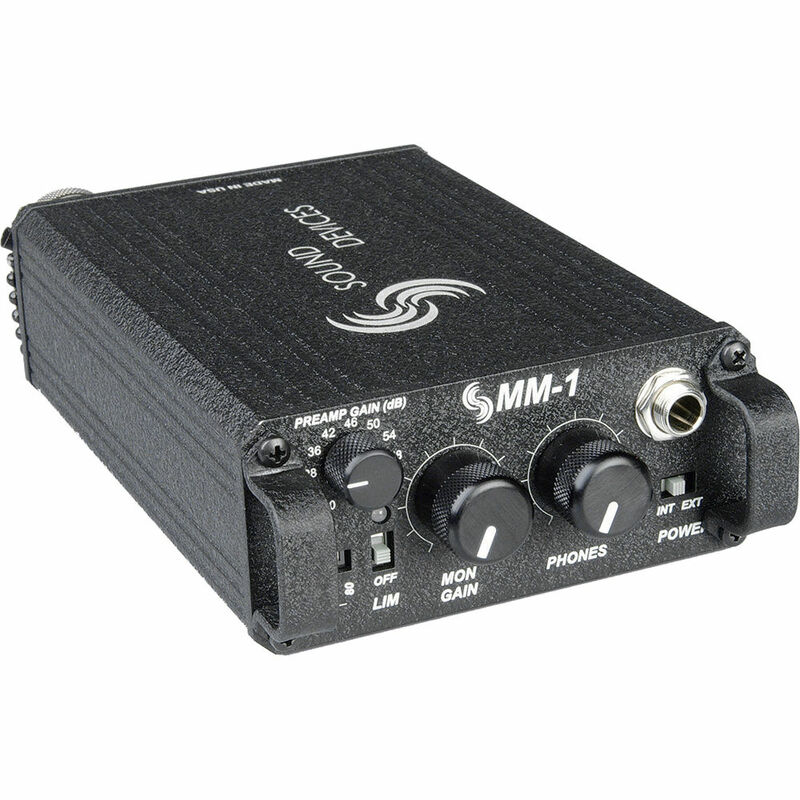 Box Dimensions (LxWxH) 10.787 x 7.48 x 4.961"
MM-1 Single Channel Portable Microphone Preamp is rated 4.8 out of 5 by 44. Rated 5 out of 5 by Stephen B. from Just what I needed I was not getting much reach with my rode ntg-3 and my beachtek dxa-8 preamp. The Sound Devices MM-1 solved that problem. I am now getting decent levels at 14 feet away at medium gain with no noise. So, if you are a one man crew and are using on camera mics (I know, not ideal) you need a sensitive preamp like the MM-1. Same electronics as the mixpre (maybe even a slightly hotter signal on the MM-1).Of course, it is only one input/output so if you need stereo, you'll need the next step up to the mixpre. The MP-1 is also good and cheaper, but has no external power option or headphone monitoring. They all have pretty much the same footprint. Rated 5 out of 5 by SICKDAWG from Ummm......... can you say the bomb!? This thing is just fabulous! I use it with my Tascam DR-40, my Rode NTG-3 and make these puppies talk with Mogami Gold series xlr's, short ones. The size of it is perfect for those hard to reach shoots, and the gain and clarity are worth every penny. This device is easy to use, seems very durable, and if you pay attention to the power button a bit, the batteries last a long time. I highly recommend this to anyone and would buy this item again for sure. I consider this the missing link to my audio rig. Now things are finally starting to sound real..........ya know? Rated 5 out of 5 by Drew the audio guy from Arguable the best amps ever This is a rock solid mic preamp made to produce professional results. After tons of research, all the pro's point to SD. The mm-1's price tag allowed me to purchase without breaking the bank. Hooked it up and worked perfectly right out of the box. I am using with a Zoom H4n and results are great. Keep in mind, if you plan to use it will an H4n, you'll need an attenuator because the H4n cant handle the mm-1's output. Rated 5 out of 5 by PhotoArtsLA from Typical Perfection I bought the MM-1 to feed the Blackmagic Cinema Camera. This seems to be a no frills unit which keeps the controls and displays to the minimum.Then, you discover the HUGE FRILL included, a combination input/output limiter which will likely pay for itself on every shoot. The limiter is exceptionally smooth and controls transient bursts with aplomb. It drives headphones to deafening levels, so, use caution. Audio quality is typical of Soumd Devices, about as good as it gets, across the board. Powering shotguns (make sure to select 48 volts, not 12!) and other mics is no issue, working perfectly. The 12 volt option allows use of certain mics requiring it, and this option can potentially damage 48 volt mics, so care should be taken. The unit is built like a tank, and is powered by just a couple AA batteries, available everywhere. Rated 5 out of 5 by Joseph from Great Preamp I bought this to power my Audix Hypercardiod mic. I run it into a Tascam DR-40 and the system works great! The preamps on the DR-40 produce quite a bit of noise if I use it to power my mics. So the MM-1 supplies the phantom power and I get virtually no noise. I just send the Tascam a line level signal and it's perfect! The limiter works great and it's VERY hard to clip. The Sound Devices MM-1 is built like a tank. One day after a long day of filming I dropped the MM-1 from about 5 feet straight onto the pavement. My heart stopped as I slowly saw it fall. But alas, there was only a small paint chip and the thing is still working perfectly. It's a bit heavy, but when considering it's durability it makes sense. Tanks aren't supposed to be light! Highly recommend it! Rated 5 out of 5 by Evalano from Necessary for any shoot The MM-1 is a fantastic thing to have if you want good clear sound. The pre-amp is great sounding and it lets the boom operator control the input level of the mic as well as the volume control of the headphones. In a smaller production where sound is recorded directly into the camera, set the XLR input to line level and the camera op no longer has to fiddle with the levels, and your sound will be much improved. I highly recommend this item: useful, rugged, simple, and it does what it's supposed to very well. Rated 2 out of 5 by Kylmor from Still get a noise floor I guess I was expecting too much. I hooked my Audix mic up to this and ran it into my Zoom H5 and get a worse noise floor than when the mic is connected directly into the Zoom and input level set on about 41/2. No matter what levels I'm adjusting to, I still get noise floor when the Zoom reads 12db. I shut off Phantom power on the Zoom in order to not access pre-amps, limiter on/off didn't matter. Adjusted gain on the MM-1 from 0 all the way up to 66db and the levels on the Zoom accordingly. Maybe I'm doing something else wrong or am expecting too much from this unit, but I'm really not impressed. Rated 5 out of 5 by Got that Broll from Using with Solo Video Production and Nar My use, record B-roll, interviews for short stories and event documentation in uncontrolled environments. I shoot solo but most of the time find someone on location to hold my mic. They seem to like the Rode blimp setup. Sennheiser K6, and Rode-NTG 2 are the mics I've used with this preamp and it's a fantastic addition. 5 stars in my book. I did tie 550 cord to the small handles to allow me to hook the device to the tri-pod. I like simple and this device is simple and it works. Gives me the gain I need to collect great audio which as you know is important. Will this work to provide line level control and phantom power to an Alexa Mini, and if so, what other components would be needed to ensure it works well? Yes, you need to make sure you have the appropriate phantom power setting; 48volt is the most common, and make sure your Alexa is set to line level input. All you need is 2AA batteries, a microphone, and two XLR cables. One to connect the mic to the MM1, and another to go out of the MM1 to the Alexa. Recommend energizer ultimate lithium batteries. They'll last days. How do I use the included DC connector? Do you plug a cable into it? what cables do I need to hook this up to my 70d?? Looks like you'll need to purchase a XLR F to 3.5mm (mono) male cable. The output of the SD MM-1 is Line level. So, the cable will need to be the type that can attenuate line level down to Mic level for the 70D to receive. the monitor headphones is mono or stereo? Hi - I use this preamp with a Tascam DR-60D Mark II recorder, so I'm guessing your DR-40 works similarly. The SoundDevices preamp sends out a line signal -- not a microphone signal -- so you would set the audio recorder input to line. (Page 48 of your manual has instructions on this.) You will not need to use gain on the recorder (and, in fact, I'm pretty sure that the recorder will not offer gain for a line signal). In my work with this preamp, I've found that the preamp gain dial on the preamp is the main setting to focus on. (If you're monitoring audio through the recorder, then the mon gain and phones dials on the preamp are irrelevant.) Depending on the type of mic you're connecting to the preamp, a preamp gain setting of 36-50 dB should work well, with an input level on the recorder of about 50%. Hope this helps! how does this work if I'm going directly in my camera (red scarlet mx..or my 5d mark 3)?? Well you'd need an adapter cable to connect it. While this would work it's really designed to supply a high quality signal to a standalone audio recorder for sync sound. It's hazardous to rely entirely on the camera for audio. A bad card or glitch in picture will affect audio as well. If the camera audio is scratch only then it's a useful reference and a backup in dire cases. If you have no option but to feed audio directly to the camera consider other options that are both more ergonomic and include a recorder: the Tascam d70 for example.